In Scalzi’s Near Future universe, Haden’s Syndrome, named after former first lady Margaret Haden, who was one of its first victims, has claimed millions of lives worldwide. Over 400 million have succumbed to the disease, which usually presents with meningitis symptoms. Most die. A lucky few survive without apparent long-term effects. But for a small percentage of survivors, there is a permanent change. They suffer from “lock in.” Their minds are alert, but they have no control at all of their bodies. With care, they can live a normal lifespan, but they will never be able to so much as blink their own eyelids. To help these lock-in survivors, three major technologies have been developed. One is called the “Agora.” More than just an online meeting place, the Agora allows lock-ins to inhabit an avatar, create their own private and public spaces, and interact with each other in a virtual reality. A second is called “threeps.” Androids that can be completely controlled by the minds of lock-ins, threeps (short for C-3PO) can interact in the real world and allow lock-ins to hold jobs that healthy persons can do. A final technology allows lock-ins to control neural networks implanted in the minds of people who are both willing and able to get them. These people recovered from Haden’s, but the neural mapping of their brains was changed allowing them to become “integrators,” able to host the neural network that allows those fully locked in to share their bodies temporarily. This allows lock-ins to actually experience life in a working physical human body, though the technology does not completely remove the body’s owner from the equation. It is a shared experience, giving lock-ins sensory experiences like taste that would otherwise be impossible. This is the setting for John Scalzi’s masterful work, Lock In. Chris Shane is a Haden, locked in since infancy but now an adult and just hired by the FBI. He is partnered with Agent Leslie Vann, a former integrator. They are part of the Washington, DC, field office in charge of Haden related crimes. Since location is not a factor in Haden involved crimes (a person’s physical body can control a threep or be in an integrator from anywhere else in the world), the FBI is automatically in charge of any crime involving a Haden. And on his second day on the job, Chris falls into a doozy. One man is dead, his throat slit, and an interrogator is sitting in the room with the body, refusing to talk. Shane’s investigation takes him via threep to the Navajo reservation in New Mexico, to Los Angeles, and all over Washington. In the process, we the readers get to know him. A former “poster child” for Haden’s, his father was a Hall of Fame basketball player who later became a billionaire real estate investor and a very politically active resident of Virginia. Seemingly everyone knows who Chris Shane is. This opens doors, but also makes people think they know him without having met him. 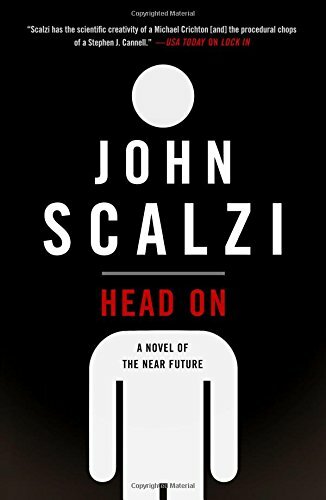 There is a tension between the public “boy with Haden’s” and the private man trying to become a good agent that Scalzi does an excellent job probing. 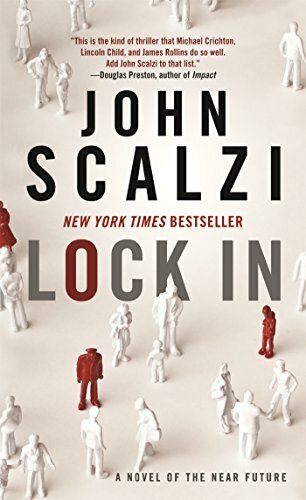 I’ve had the pleasure of reading many of John Scalzi’s books, and although this book did not win the big awards that some of his others have, in my mind it is one of his best. Every character, even the fairly minor ones, is written with compassion and understanding. They are complete, whole people. Some are likable, some are appalling, but all are whole. You feel the pain of being locked in, the freedom and constraints of living life in the body of an android, the challenge of sharing your own body with someone else, the pain one character has being mentally challenged and how that leaves him open for manipulation and abuse by others, and the tension between those who are “able” and those who are “different.” Scalzi does not avoid the live electric wires of race, gender, sexuality, and ability. Rather, he grabs those wires to give power and life to the wonderful characters in Lock In. A more timid author would shy away from some of the topics in Lock In. A lesser author might try for a simple or easy answer. Scalzi is a master. He is able to introduce subjects that make you think, yet avoid being heavy handed or dogmatic. Part of the backdrop of the novel is the political battle over rights and funding for Hadens. The fault lines look familiar to anyone who reads today’s news. But Scalzi avoids stereotyping or judging. Some are for, some are against, but all have their reasons and no one is completely with the angels. Read Lock In. Read everything by Scalzi. You’ll be glad you did.